News from the stores: A Glimpse of Life from the Edge Or "Let’s get something out of the freezer for dinner"
A Glimpse of Life from the Edge Or "Let’s get something out of the freezer for dinner"
Whilst trying to unravel the evidence for early human occupation of our area during the Ice Age I have been struck by not only the wealth of artefacts we have in our collections but also the depth of pioneering research carried out by some of our notable Victorian antiquarian collectors. Some of these names include James Wyatt (1816-1878) and Worthington G Smith (1835-1917). 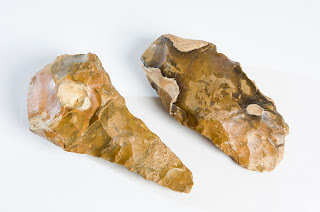 Both of these collectors were amongst the first to realise that these roughly hewn flint shapes appearing deep down in the river gravels were not the result of natural rolling and bashing in the riverbed but were very deliberate, specialised, manmade tools. They also realised that because the flint tools were appearing in the same deposits as those containing the bones and tusks from ice age mammals that early man had to be contemporary with many of the larger mammals. The concept that mankind have evolved over time did not always sit very happily with the official church doctrines or even with society in general at the time. The flint tools retrieved from these sites tend to be fairly large, roughly shaped hand axes and flakes. Today when we handle these items they seem smoothed and worn and this is precisely what has happened to them. These once razor sharp tools have been removed from their place of discard or last use and have been swept along by ancient rivers which became flooded and turbulent with the melt waters from ice sheets and glaciers melting and refreezing over a long period of time. The sort of time period experts are talking about for the Palaeolithic period is 1,000,000 BC to 10,000 BC. Looking at this almost incomprehensible span of time we are doing well to find any evidence for large mammals let alone humans and even when we have found them, we have to be able to recognise them! 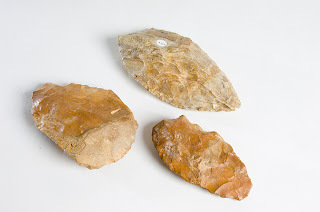 A selection of flakes and hand axes from Biddenham, Beds. So what were our ancestors doing with these flint tools? Evidence for their use comes from two main sources, the objects themselves and a more recently evolved method of study, Experimental Archaeology. Some finds of bones of Ice Age mammals have been found cracked and broken in a specific way and this has led archaeologists to believe that humans were using the heavy and sharp hand axes to deliberately open up the bones to remove the nutritious bone marrow from within. 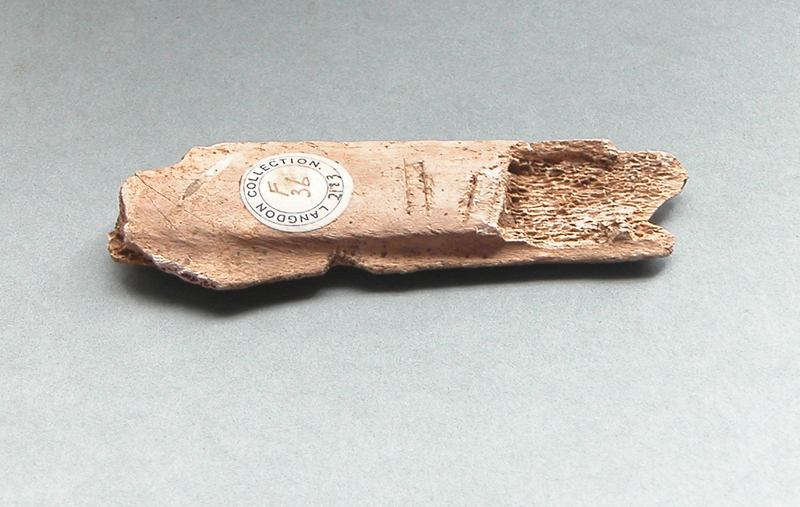 Other bones show cut marks and scrapes indicating that the sharp flint tools were used to cut flesh and sinews from the bone. A bone from Kempston with visible cut marks. The popular image of early man and their diet often starts with the premise that people hunted in bands killing large wild animals and supplementing their diet with berries and leaves. Whilst some of this may be the case it is more likely that early hunters were more scavengers of already dead or nearly dead game. The need to keep close to the animals that roamed around the landscape would lead them by necessity to have a nomadic life style. During the warmer periods throughout this vast expanse of time they could dine on elephant, deer, oxen, rhinoceros, hyena and maybe even hippopotamus. During the colder periods the choice of menu would change to mammoth, woolly rhinoceros, reindeer, bison and arctic hare. Once you start to think more deeply and consider the evidence we have today of what conditions and life was probably like back in the Palaeolithic period it is just amazing that mankind has survived at all and that the whole of human history is a real testimony our resilience and adaptability as a species.